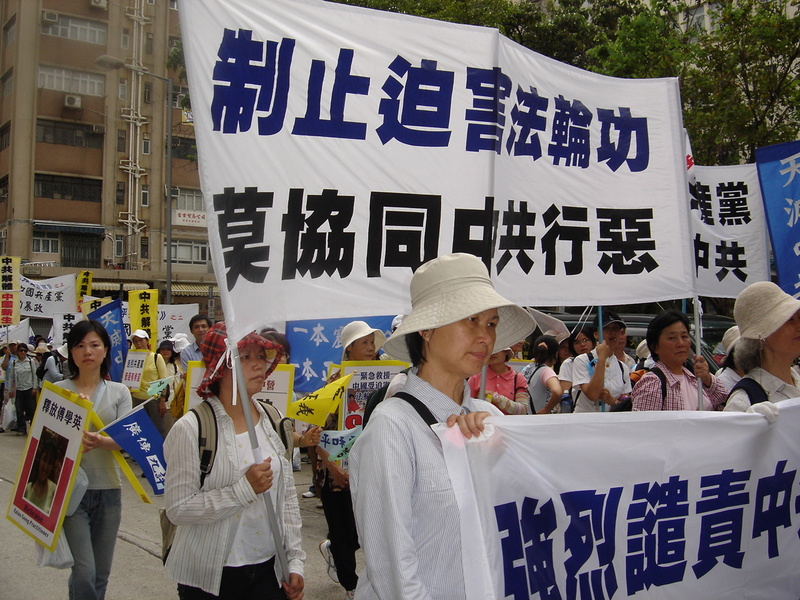 (Clearwisdom.net) On April 29-30, 2006, a grand parade entitled "A Call to Conscience, Oppose the Persecution" supporting the ten million Chinese people quitting the CCP and its affiliated associations was held in Hong Kong. More than 1,500 people participated, including Falun Gong practitioners, volunteers from the Service Center for Quitting the CCP and The Epoch Times, Hong Kong democracy activists and supporters from all walks of life. Led by the huge long narrow flag reading "Heaven Eliminates the CCP," people held all kinds of banners, colorful flags and truth clarification display boards marched through the busiest areas of Hong Kong accompanied by vigorous drumbeats played by Flag and Drum Troupe, Tang Dynasty Drum Troupe, Waist Drum Troupe and Western Drum Troupe. Resounding slogans called for justice and conscience, attracting attention from Hong Kong people and all tourists. Many Falun Gong practitioners from Taiwan participated in the parade. They felt that people on both sides of the road were happy to see them. Many people took pictures, or videotaped the parade. Some people made thumb-ups to show their support. Mr. Huang who has grown up in Hong Kong stood on the street for a long time, he gave a thumb-up to people who participating in parade. He expressed that he has been showing his support for all parades held in Hong Kong that support the withdrawals from the CCP. He read The Epoch Times newspaper and he cried and felt outraged for the CCP's brutality. He felt he was so happy being born in a free and democratic Hong Kong. He hopes the CCP will collapse soon, so the compatriots in the Mainland can live a happy life. A practitioner's whole family participated in the parade. The wife and daughter wore in white dresses and carried photos of practitioners who have died as a result of the persecution. The husband distributed flyers and clarified the truth to passersby. During the activity of the Truth Clarification Great Wall composed of banners and display boards held at Tsim Sha Tsui Ferry, practitioners distributed flyers at the pier. One practitioner shouted one sentence in English "NO More CCP" to every westerner who passed by. Some turned around and smiled at him. Ms. Liu and three of her children came to participate in the parade. She expressed that Hong Kong is a special place, the only free land under CCP rule, where people can hold parade to express their concerns. There are many Chinese tourists, so it carries special meaning to come here to support the ten million Chinese people quitting the CCP. She hoped the Chinese people can have a beautiful future, and escape from tyranny. 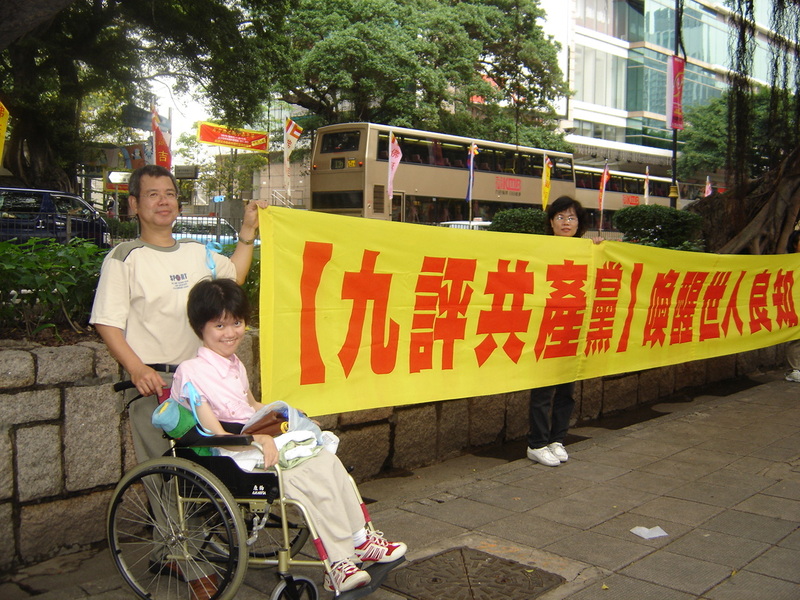 She hopes for an end to the persecution of human rights advocates and Falun Gong practitioners. Her neighbors and friends all supported them to come to Hong Kong to participate in the parade. Ms. Lim who sells jewelry at a department store expressed that her customers are from around the world. During her work, she told her customers about quitting the CCP and the persecution of Falun Gong in the Mainland. When she told them about the Falun Gong practitioners who have their organs harvested by the CCP and their bodies cremated to destroy the evidence, people were shocked, and thought it is inevitable that the CCP will disintegrate. Ms. Chen who came from Chiayi, Taiwan used to suffer from goiter and gynecological diseases. Her health was so poor that she would breathe heavily while walking. One week before scheduled surgery, her brother's wife introduced her to Falun Gong. All her illnesses disappeared. She was spared an operation, and no longer needs to see doctors and take medicine. Such a good practice is banned in the mainland, and Falun Gong practitioners there have suffered so much, therefore she must step forward to oppose the CCP's atrocities and call for the world's people to help stop the CCP's persecution of Falun Gong. Ms. Guo from Tainan is paralyzed and in a wheelchair. She participated in the parade accompanied by her parents. What has made her so strong-willed as to come to Hong Kong for this grand parade? She used to seldom go out before. Ms. Guo has suffered from illness from a child, after practicing Falun Gong, her health improved a lot. She no longer needed to see doctors. In the past three years, her parents have not worried much about her. 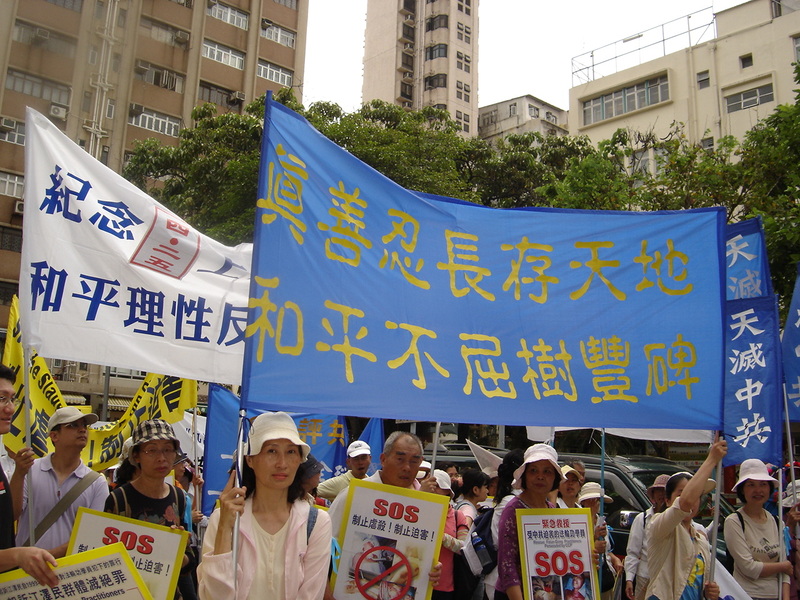 The suffering of the Falun Gong practitioners in the mainland urged her to step forward to stop the atrocities. 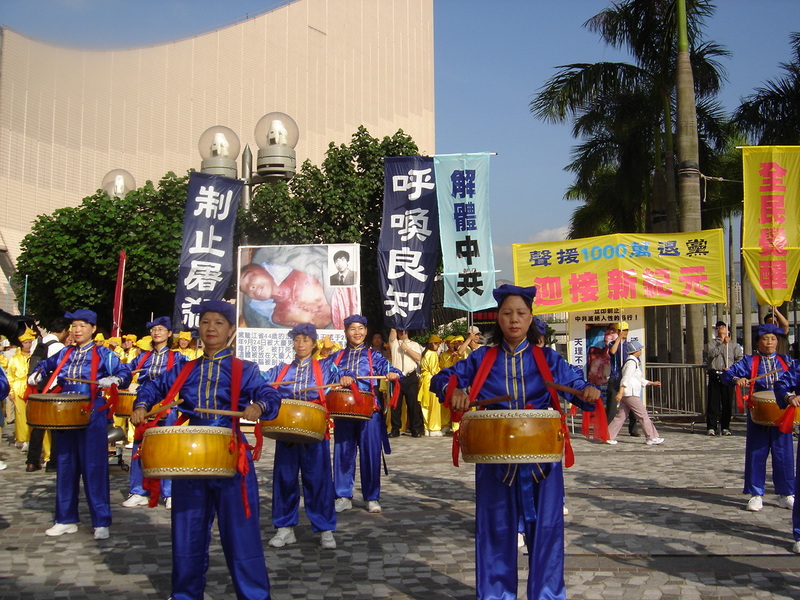 The Western Drum Troupe from Taichung was set up on April 15, 2006. 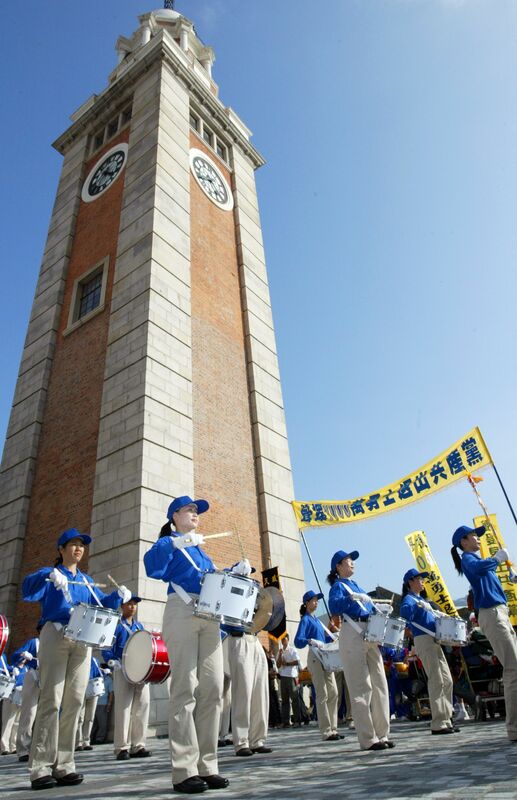 With two weeks training, the drum troupe was able to participate in April 23rd parade in Taiwan and April 30th parade in Hong Kong. The band gained high praise. What is more amazing is that most of participating practitioners almost know nothing about music and have never touched any musical instruments. Two sisters in the troupe each hung a picture they drew at Minghui School entitled, "Urgent Rescue Falun Gong Practitioners Who Are About to Have Their Organs Removed in the Mainland," hoped to draw people's attention and stop the CCP's atrocities. Some practitioners who have come to Hong Kong to participate in truth clarification many times expressed that, last month when they came to Hong Kong, they stayed in Youth Hostel. The following morning, they did the exercises and a group of students from a primary school in the mainland who also stayed in the Youth Hostel surrounded them. They have been deceived by the CCP's propaganda and felt in disbelief that Falun Gong is a good practice benefiting people both physically and mentally. 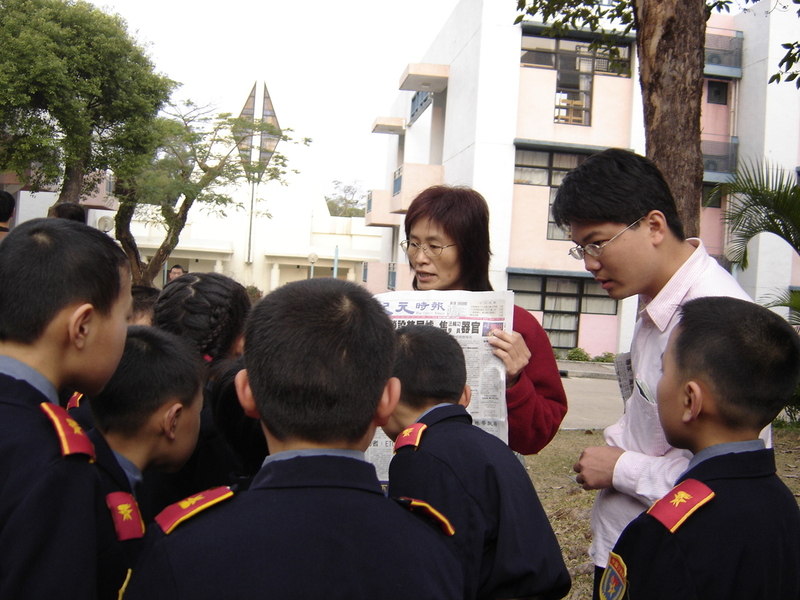 A teacher who teaches in primary school in Taiwan told these students her experience of teaching primary school students in Taiwan to learn Falun Gong. Many students in Taiwan have made progress in their physical and mental wellbeing and their school work. Some practitioners also told these students from the mainland about the Nine Commentaries and the news about quitting the CCP, in hopes that they will quit the Young Pioneers League.